Home Beers Lake Effect Brewing Co.
Barrel Aged Imperial Stout | Lake Effect Brewing Co. Poured into a Fremont small snifter. Pours a very dark mahogany brown, appearing opaque black in the glass with only a few patches of foam and no lacing. Aroma of dark toasted malt, bourbon, milk chocolate. Flavor is semi-sweet dark toasted malt, bourbon, molasses, milk chocolate and light toffee and vanilla. Medium bodied with light creaminess and sharp carbonation despite the still pour. Very dark barrel aged stout, the aroma was somewhat simple, dominated by the bourbon, but the flavor is both rich and surprisingly complex. Bourbon is still the dominant flavor, but excellent malt base and nice chocolate and other flavors. Tastes great and a nice introduction to this brewery. A friend brought this back from the mainland and it was definitely worth the smuggling. Pours a really lovely deep dark amber brown. Smell is nice without a real punch in the face. Taste is smooth and gets even smoother as the temp rises. Taste - Not a "cream", Dark, Malty with shot of whiskey which becomes seriously addicting. Complex taste which might make you look to see if your parents are looking as one greedily takes another sip! Pitch black pour, two fingers of deep brown foam. Retention and lacing are minimal. Aroma is deep and rich. Big bourbon, oak, chocolate, anise, slight char. Taste is extremely similar, but reversed. Chocolate and anise first. Bourbon and barrel make themselves known after the swallow. Big, full body, low end of carbonation, and very balanced finish. This is superb. This is a dark, thick, sweet, heavy aged stout. I think it's Lake Effect's response to the well-known BCBS from another brewery just a couple miles away. Lots of great flavor notes that come through in different combinations - coffee, vanilla, chocolate, oak, bourbon, and so on. Perfect for a cold night and a warm fire. 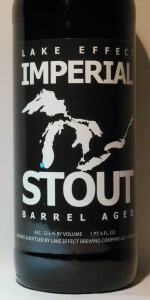 Barrel Aged Imperial Stout from Lake Effect Brewing Co.